The Ajanta Caves are a series of 29 Buddhist cave temples in Ajanta, India, some of which date from the 2nd century BC. 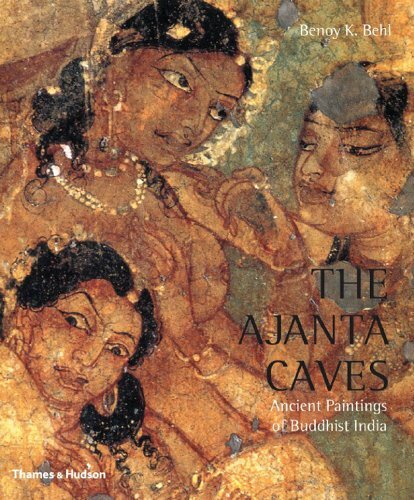 Encompassing both Theravada and Mahayana Buddhist traditions, the Ajanta caves preserve some of the best masterpieces of Buddhist art in India. Many visitors explore the Ajanta Caves in conjunction with the nearby Ellora Caves. The caves are numbered from east to west, 1 through 29. Today, a terraced path connects the cave, but in ancient times each was independently accessed from the riverfront. A viewing platform across the river affords an excellent view of the entire Ajanta site. The natural beauty of the area makes it clear why the monks chose the site for their spiritual pursuits. Preserved inside the caves are many masterpieces of Buddhist art. Some reflect the earlier Theravada tradition of depicting the Buddha only in symbolic form such as a throne or footprints. Others, the Mahayana caves, feature colorful murals and statues depicting the life (and former lives) of the Buddha and various Bodhisattvas. The caves also depict scenes from everyday life and many include inscriptions indicating a prince or noble who gifted the cave to the monks. It is most practical to explore the Ajanta Caves in reverse numerical order, so they are presented in this way below. This keeps you somewhat out of the masses of people moving from cave to cave in the other direction, and brings you out at the exit at the end. The numbers of the must-see caves are in bold. Cave 26 – A Mahayana prayer hall (chaitya). The highlight is a large carved statue of the reclining Buddha, representing his moment of death. Below him, his followers mourn his passing; above, celestial beings rejoice. The cave also contains a stupa with an image of the Buddha in a pavilion. Cave 17 – A Mahayana monastery covered with many well-preserved wall paintings. Maidens and celestial musicians are on the ceiling, and Buddhas, celestial guardians, goddesses, lotus petals and scroll work adorn the doorway. One mural in Cave 17 shows Prince Simhala's encounter with the man-eating ogresses of Sri Lanka, where he'd been shipwrecked. Another shows the king of gods flying amidst clouds with his entourage of celestial nymphs (apsaras) and musicians. The panel above the doorway depicting the seven Manushi Buddhas (Buddhas in human form) together with the Maitreya or future Buddha, seated under their respective Bodhi trees. Cave 16 – A Mahayana monastery featuring a beautiful painting of the princess Sundari fainting after learning that her husband (the Buddha's half-brother, Nanda) was going to become a monk. Cave 15, 13, 12 – Theravada monastery caves. Cave 10 – Theravada prayer hall, thought to be the oldest cave temple at Ajanta, dating to the 2nd century BC. Cave 9 – One of the earliest prayer hall caves, notable for its arched windows that let softly diffused sunlight in the cave. This Theravada cave also features a large stupa. Cave 8 – Theravada monastery cave. Cave 4 – Incomplete, but the largest of the Ajanta monasteries. Cave 2 – The façade of this Mahayana monastery cave shows the kings of Naga and their entourage. Inside, a glorious mandala dominates the ceiling, held by demons and decorated with birds, flowers, fruits and abstract designs. The ceiling gives the effect of a cloth canopy, right down to the sag in the middle. Cave 1 – The most popular of the monastery caves at Ajanta. Every inch of the cave was originally painted, though much has worn away over the centuries. The doorway to the antechamber is flanked by murals of two great bodhisattvas. On the right, holding a thunderbolt, is Avalokitesvara (or Vajrapani), the most important bodhisattva in Mahayana Buddhism. On the left, holding a water lily, is the bodhisattva Padmapani. The sidewalls of Cave 1's antechamber show two scenes from the Buddha's life: his temptation by Mara just before his enlightenment and the miracle of Sravasti, where the Buddha multiplied himself into thousand images. Above the left porch of Cave 1 are friezes of the Three Signs (a sick man, an old man, and a corpse) that the Buddha saw on his fateful journey outside the palace that led him to become a monk. In the sanctum is a colossal sculpture of the Buddha in the preaching pose. Murals on the walls of the main hall depict numerous Jataka Tales, stories of the previous lives of Gautama Buddha. The Ajanta Caves are not easily accessible to visitors but, of course, that was the point. The drive from the nearest major town, Aurangabad, takes between 2 and 3 hours. By Air (to Aurangabad): According to Frommer's, "the quickest, most sensible way" to get to Aurangabad is to fly Jet Airways (about 45 minutes and about $75) from Mumbai to Aurangabad's airport. By Rail: The nearest train station is Jalgaon, which connects to many cities in India. An even more major station is Bhusaval, 28km from Jalgaon. From Jalgaon, you can take a taxi to Ajanta. By Road (to Aurangabad and Ajanta): Taxis and auto-rickshaws are widely available at Aurangabad airport and Jalgaon train station. A taxi from the airport into the city should cost about Rs 100. In the airport's arrivals area is the MTDC Holiday Resort, which provides brochures and tour bookings for the caves. Also located there is Classic Travel Related Services, which will arrange any kind of transport for Aurangabad and surrounding areas, including the Ajanta and Ellora caves. A full day with car and driver costs about Rs 1,200 ($26). The drive from Aurangabad to Ajanta takes 2 to 3 hours, so start early to beat the midday heat. Most visitors are dropped off in the Ajanta caves' parking lot, where you'll find plenty of tacky souvenirs for sale and eco-friendly buses waiting to take you the short way up to the Ajanta Caves ticket office. Alternatively, you can be dropped off at the viewpoint across the river, reached via a turnoff slightly before the parking lot. If you're in good shape and steady on your feet, this option is worth the trouble. From the viewing platform, make your way down the difficult footpath and across the footbridge spanning the Waghora River. Arrange to have your driver pick you up at the parking lot when you're done. The Rock-Cut Caves at Ajanta – Buddhamind – Includes map showing layout of the caves on the river and several detail photos. Ajanta Caves – India Travel Log – A first-hand account, with photos, of a visit to the Ajanta caves. Below is a location map and aerial view of the Ajanta Caves. Using the buttons on the left (or the wheel on your mouse), you can zoom in for a closer look, or zoom out to get your bearings. To move around, click and drag the map with your mouse.